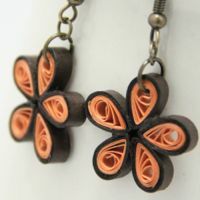 This tutorial will show you how to make your own paper quilled daisy earrings. These daisy flowers are one of the basic quilling shapes, so they are great for a beginner to make! This tutorial was first published on Red Ted Art, but I wanted to post it here as well with some additional guidance. Be sure to check out the Red Ted Art site, it has SO many awesome craft ideas! These daisies can also be used as decoration for greeting cards, frames, magnets, and even put onto hairclips! This tutorial includes basic quilling instructions as well! If you don’t have a quilling tool but you still want to try this out, just use a toothpick! When I started quilling when I was 10 years old I used a toothpick as I didn’t have a tool until a year or so later. It’s a little harder to start rolling, but after a few tries you’ll get the hang of it. You just have to use your thumb to tuck in the end of the strip to start rolling. Before I had a proper sizing template I made my own. Use a piece of thick styrofoam and draw the circles on in whatever sizes you want. Put four pins around each circle and you have your template! put a scroll inside the four pins and it’ll expand to the size of the circle you have drawn. If you really enjoy paper quilling you’ll want to invest in a proper sizing template (see one here on Amazon). They are really great and it’s so easy to use. Plus they last forever! I’ve been using mine for more than 10 years. 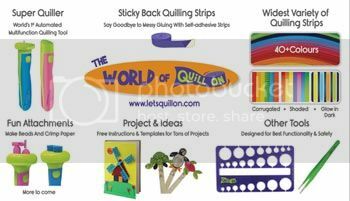 You can use any paper or craft glue for paper quilling. It’s a personal preference what kind you like to use. I used to just squeeze some out of a bottle and use a toothpick to apply it, but now I prefer to use a fine tip bottle so there is no waste! My very favorite glue of all is PPA (Perfect Paper Adhesive) which I found this year (can be found here on Amazon). Now it’s almost the only glue I use! Well, in this tutorial I was using elmer’s craft glue, which is great as well (find it here on Amazon). I use it when I’m traveling because the bottle is so handy and small. I really prefer to pin these daisies while they dry so they are even and don’t get bumped out of place. If you don’t have a corkboard, just use a piece of styrofoam with pins, or a couple layers of corrugated cardboard with plastic or wax paper on top and pins. Like my sizing template I’ve been using my corkboard for over 10 years and it’s still in perfect shape! I just change the plastic covering every couple years or so to keep it fresh. 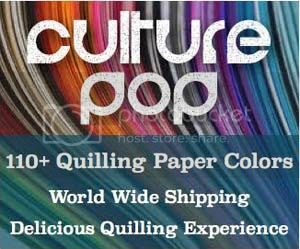 If you do paper quilling often it’s definitely a worthy item to buy! One of the sealants I use is PPA (Perfect Paper Adhesive). Not only is it the perfect glue, it’s an awesome sealant!! I just use a tiny paintbrush to apply it to one side. Let it dry and apply it to the other side. Easy peasy and your paper quilling is water resistant! If you try this tutorial out, let me know! Have any questions, ask away! You can also make these into adorable hairclips! Click here to find out how. Click here to view more free tutorials! I enjoyed your instructions but found none for the very last photo where the flowers have a black border or tape or? Let me know please. Thanx! Thank you for your comment 🙂 In the tutorial I use the two colors of orange for the flower. If you want a black border, use black as the shorter outside piece instead of the darker orange (and of course use any color you wish for the middle. So for the blue/black flowers I use a 6″ strip of blue and 3″ strip of black for each petal. Hope that helps, let me know if you have any further questions! Thanks for sharing your photo, they look great! beautiful…is there any alternative for template board? This looks wonderful! If I were to do hairclips, do I need to use sealant? Thankyou so much for the lesson, I have been sat at my comp for an hour going through it and have plucked up the courage to have a go, it’s fantastic, I’ve never done this before and am very pleased with myself. So glad I could help, Suan! Make sure you subscribe to the blog and/or the newsletter so you know each time a new tutorial is up on the blog! hi, i applied shiner for my earrings. after few days it spoiled as vishnupriya said. is ter any alternate way to get back my earrings in original.